On the digital marketing front, Facebook still leads in terms of the number of users (PNG) but marketers are being faced with the challenge to generate quality leads and convert to actual sales. Which part of PNG are you from Ian? Tell us more about yourself. My name is Ian Hetri, I am from Morobe Patrol Post in Morobe Province in Papua New Guinea. I am what you call a typical village kid who made it from the village to the global stage. Did all my schooling in the village and later came to Salamau High then to Bugandi secondary school then later to the University of Natural Resources and Environment and graduated with a bachelor in tropical agriculture in 2008. In 2014, I was selected under the Pacific Island Leadership as an emerging young leader to study leadership in East-West Centre, University Hawaii. On my return, I started my own business LinkPad Technologies & Publishing. Growing up from the village, I have seen and felt the hardship and struggle our people face every day. I had always had in my heart to start my own business when I grow up. To serve my people. And your colourful career journey too. As a recipient of corporate sponsorship from New Britain Palm Oil Limited in Kimbe, I was flown straight to the plantation in Kimbe, West New Britain province after graduation in 2008. I started as a management cadet. I then left in 2009 to pursue postgraduate studies but due to lack of funding, my dream felt sort and I found myself back in Hargy Oil Palm Limited in Bialla, West New Britain. This time as a divisional manager. It was in Bialla that my eagerness to venture into entrepreneurship started taking shape. I dug deeply into online business. I watched videos, read blogs, engaged with overseas online entrepreneurs in public forums. The more I studied, the more I wanted to learn more and the more I wanted the digital nomad life. I resigned in 2011 and took a one-way ticket to Port Moresby with my small suitcase and laptop bag with just enough money in my account. A few months later, I was rejected by my own family in Port Moresby. With no money and no family to turn to, I survived with a college mate’s family for a few weeks. I said to myself, I am not going be treated like this. I am going to prove my family wrong. With my laptop, I wrote my way out of a life of rejection, pain and tears. I would sit up till 3 or 4 am in the morning and write and study business. In the morning, I’d search for a job. See I needed a room of my own, I needed privacy and I needed to focus. So I joined an Indian own technology company as a salesman. I used my writing skills to write directly to pitch to the GM, went for an interview and started the work the same day right after the interview. It was right there, I discovered the power I had in my writing and speaking. I sold my way into the well-paid sales position. I late joined two media organizations as business editor. I had to do it because I still wanted to pursue my dream of owning my own business and media joining the media organization was the right thing to do because I believed it would open doors for me to rub shoulders with and learn from the rich and famous and the powerful business elites. As it turned out that was a smart and wise move. Some of the big guns I connected with during my media days have become my clients. Papua New Guinea as an emerging economy is progressing well. What are you seeing from the digital perspective in the last few years? The opening of the telecommunication sector in 2007 to international competitions was indeed a wise move by the government. Data given by UN’S International Telecommunication Union indicates mobile coverage increase from just 3% in 2006 to 80% in 2016 and mobile penetration rate remained at 54.2 %. This is an amazing result from PNG standards but still, the lowest compared to other countries in the world. The very clear trend we have observed over the years is that more and more Papua New Guineans are coming to realize the power of the internet. And most online searches are conducted using mobile devices. The finance sector, with banks and superannuation funds, are taking a leading role in the use of mobile technology in delivering their services and only proves that the mobile market has a huge potential. The platform that is in its boom period is LinkedIn but not widely used in PNG is LinkedIn. For a service-based business, LinkedIn offers the best option. Most Papua New Guineans haven’t tapped into LinkedIn yet. Law, accounting, insurance companies and other professional service providers can greatly leverage LinkedIn to build a brand and increase sales. Why? Because most of the professionals who need your services are on this platform. On the digital marketing front, Facebook still leads in terms of the number of users (PNG) but marketers are being faced with the challenge to generate quality leads and convert to actual sales. It is a skill that most SME owners lack. That brings me to data-driven marketing trend. It is a trend that we will see more and more as the leading social media platforms become congested with more and bigger business pumping more money into social media marketing, search engine optimization, content and email, and influencer marketing. Companies, big or small will be forced not to only drive content marketing but also look for tools and the know-how to mine consumer data, interpret and run highly targeted marketing to maximize return on investment for the marketing campaigns. On the economy as a whole, there are lots that need to be done in terms of ICT growth in PNG. We need to create a dynamic startup ecosystem that will fuel the growth of digital businesses and social entrepreneurship that seeks to solve everyday problems faced by our people. Digital vertical, where do you think it is heading? I want to be very optimistic about this. The future of PNG in terms of digital looks bright. According to NICTA, more people already spending a lot of time on the internet the study revealed that during the average week it’s 5.6 hours spent on the web and 6.3 hours on the weekend, the time being driven by the consumption of social networking sites like Facebook and the free browsing option offered by the mobile provider. Private organizations like my own company, LinkPad, PNG ICT cluster, Blockchain Pacific and Kumul Game change are doing lots to advocate and drive change in ICT in this country and these are very young people driving this. Leadership is changing from old to young, vibrant and industrious leaders taking over and in a few years, ICT, I believe will the leading industry when all natural resources are exhausted. You’ve been extremely passionate about LinkedIn. Why? My choice to be active on LinkedIn was more of a marketing choice than a personal choice. When Facebook tweaked its algorithm not long ago, my company’s Facebook business page got hit hard. The organic reach dropped dramatically. I started paying more to reach more people on Facebook and I thought, uhhm, let me explore other platforms. That is when I started experimenting a few things on LinkedIn. Just as I thought, my personal LinkedIn following exploded from a mere 500 connections to 10,000+ in a space of 8 months as we speaking now. I generate high quality leads every week on LinkedIn using content marketing. These are the people that influenced me to triple down on content creation and distribution on all social media channels and not only LinkedIn. Gary Vaynerchuk, Grant Cardone and Neil Patel. Why are you producing original articles on LinkedIn, is there any particular objective you are after? Why do I produce original articles for LinkedIn? Simple answer. Authenticity. It converts. Yes, authenticity converts. But how? I follow Gary Vaynerchuk’s million dollar advice. Document your progress. Many people want to show up as experts or gurus or whatever you call it. I don’t. I do the show and tell and use the good old storytelling, sprinkle a little dose of headline hacks and power words and boom! I am very intentional with every article I posted on LinkedIn every single day. That is to engage users, build my personal brand as a thought leader in my niche and use my personal brand to drive sales to my business. Tell us more about LinkedInLocal PNG. LinkedinLocal is a series of networking events spreading its wings around the world where LinkedInders like you and me take themselves off the internet and show up in person, meet other professionals on LinkedIn get to know each other and foster genuine career and business relationships. Already spread over 150 cities around the world and for the first time, we are bringing this global event to Papua New Guinea. 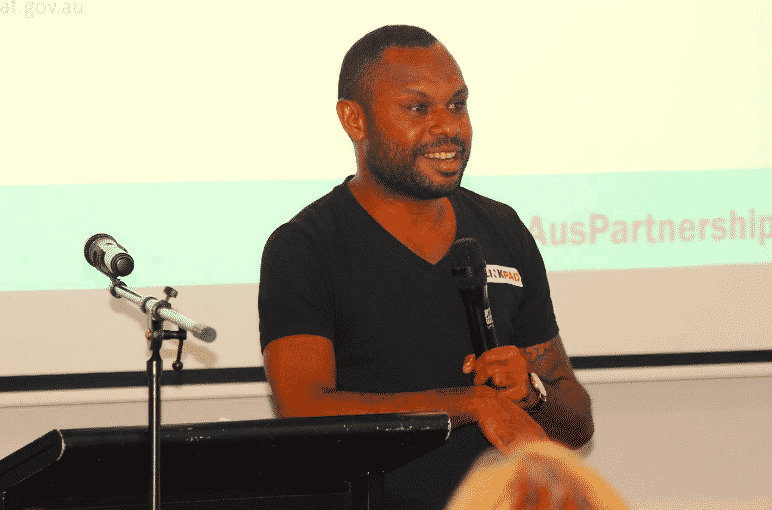 Most LinkedinLocal events in overseas countries are just for networking, I have decided to tweak this a little and make it an educational event with speeches from LinkedIn influencers in PNG as well as successful entrepreneurs sharing their stories to inspire others to get into a business. My vision is to connect all LinkedIn professionals around the Pacific region in one digital platform and PNG is just the beginning of a bigger vision. How to reach out to you? Simply connect me on LinkedIn here, and then reach me out via a direct message. I will reply the soonest possible.